Tech support logs are used for offline troubleshooting. This article describes how to collect tech support logs from a single Avi Controller or 3-node Avi Controller cluster. Note: In a 3-node Avi Controller cluster, the steps mentioned in this article automatically collect logs from all the three nodes. The commands need not be entered separately on each Avi Controller node. Follow the instructions in this section to collect tech support logs from the Avi UI. 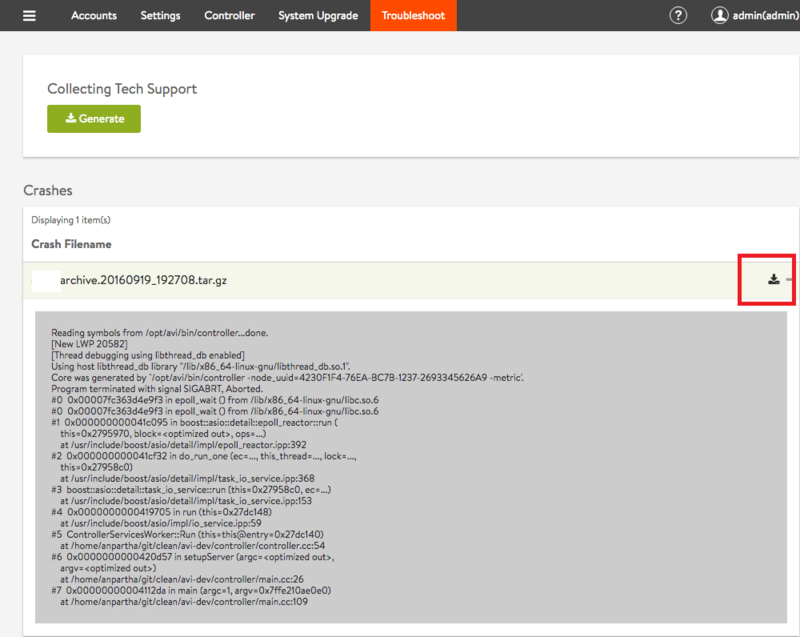 Navigate to Administration > Troubleshoot and select Generate to create tech support log files. Click on the plus sign at the rightmost position in the archive row) to display additional information. Click on the download icon as shown in the below screenshot to download the tech support file to the local drive. Download the .tar.gz file and then convey it to Avi Support for further troubleshooting. Follow the instructions in this section to collect tech support logs from the Avi CLI. In an Avi Controller cluster, one of the nodes is the leader or the primary node. Login to the leader node using any ssh client, such as putty. 10.10.1.1 is the leader node in this example. To know more about the leader node in an Avi Controller cluster, refer to Overview of the Controller Cluster. To know more about SSH key generation, refer to Avi CLI access. Type shell command, and enter your credentials. From the shell prompt, run the command show tech-support serviceengine. The command show tech-support serviceengine create debug logs for the particular SE. Note: For reference, Avi-Cluster1-SE1 is the Avi SE for which we want to collect the debug logs. This command generates core files and other debug logs, which are stored in /tmp directory on the Avi Controller leader node. Use cd/tmp command from the Avi CLI to get access to the tmp directory. Check the debug logs and the other log files, which are available in compressed form with tar.gz extension. Sample tech support log file: debuglogs.20170915-124030.tar.gz The number 20170915 in the log file debuglogs.20170915-124030.tar.gz represents the date of generation of the log files, i.e., 15 Sep 2017. The following command collects the debug logs on each of the Avi Controller nodes. This option keeps the collected tech support bundle to a minimal size. The option is especially useful if the core archive bundles that are present have already been uploaded and fixed. The following command includes the collection of the core archive bundles. Follow the commands in this section to collect tech support logs using REST API.